Mothers who bottle feed their babies have expressed outrage via social media over a feeding area in a parent's room at the Brisbane Pregnancy, Babies and Children's Expo that they said made them feel unwelcome & that favoured breastfeeding mothers. Women who bottle feed took to various online mother's groups to express their anger and feelings of segregation over the separate feeding areas/seating arrangements provided while others expressed their sadness and guilt at not being able to breast feed. 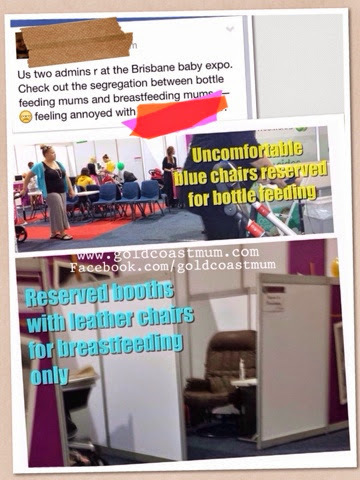 One mum attending the Expo that was held in Brisbane over the weekend, shared her 'annoyance' saying: 'Check out the segregation between the bottle feeding mums and breastfeedin mums'. An image include the captions: 'Uncomfortable blue chairs reserved for bottle feeding' and 'Reserved booths with leather chairs for breastfeeding only'. 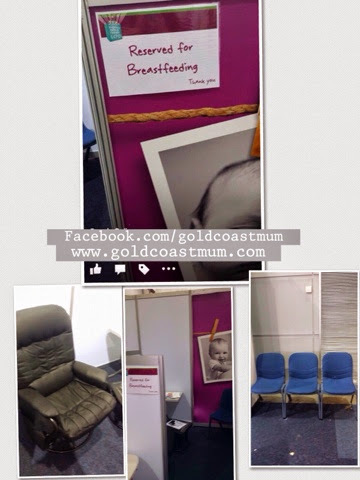 Another attendee said she was asked by a midwife in the parent's room whether she was breast or bottle feeding, and after stating that she was bottle feed, was directed to the blue chairs - not a private booth that was reserved for breast feeders only. 'There were no mums waiting to breastfeed at the time and there were multiple booths free. Now, considering this was an expo for pregnancy, babies and children, I would expect them to be more understanding'. 'It's bad enough that the S26 and Karicare stalls aren't allowed to give out samples of newborn formula as "breast is best",' she said. Others who attended the expo commented on the posts/complaints saying that when they attended on other days/times, the comfortable chairs were also available outside of the booths and another said she was told anyone could use the booths. So it appears while some attendees enjoyed the areas on offer with no issue, others had different experiences and felt the issue needed attention/awareness. As a breastfeeding mother I'm glad private areas were provided, as it's something many of us may like to do in private to avoid too much exposure (especially new mums. I'm now more of a feed anywhere anytime kind of gal while exercising some discretion). 'We found that with our ever-growing diverse culture, there was a need for private breastfeeding rooms - so we decided to build some little alcoves for mummies who are of a culture that requires this - and it's been so well-received'. 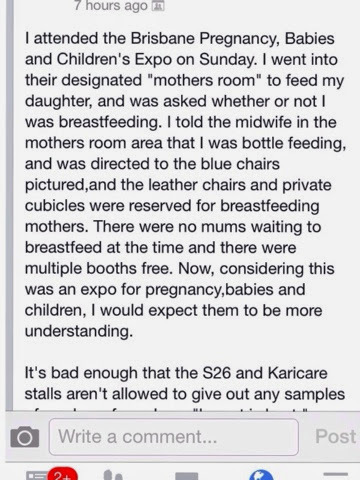 'I myself feel no shame or discrimination against the breastfeeding rooms at the Expo. I think they're wonderful, and shows the Expo is trying to cater for all requirements. 'I am sure you are already aware of the WHO code on infant formula, which bans its' advertising and promotion. We (the Expo) are legally bound by this in Australia, hence no formula sales or promotion are available at the Expo. S26, Nestle and Karicare promote their follow up formula, or toddler milk. The Expo has an equal stance on breast/bottle - we have the wonderful Australian Breastfeeding Association at all our Expos offering breastfeeding support and advice, and we also have all the major brands with their bottles - Avent, Miomee, Tommee Tippee, to name a few'. What are your thoughts? Would you be offended/outraged or do you agree that breastfeeding mothers should have some privacy?